Two Self-Funding Candidates Have Spent The Most On Broadcast Ad Time So Far, But Others Are Beginning To Increase Their Spending As Election Day Nears. LANSING (JULY 9, 2018) — With Michigan's August primary election a month away, candidates and other groups have hiked their spending on political advertising. 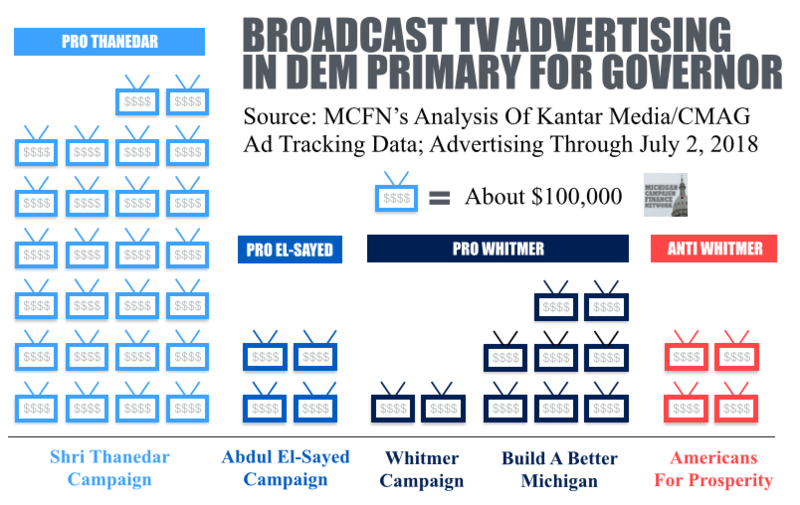 About $3.0 million in political ads ran on broadcast TV in Michigan from June 19 through July 2, according to the Michigan Campaign Finance Network’s analysis of Federal Communications Commission filings and Kantar Media/CMAG ad-tracking data. That total makes the period from June 19 through July 2 the busiest two weeks for political ads so far in 2018 in Michigan. For the year, MCFN has now tracked an estimated $8.3 million in political ads aired on broadcast TV through July 2. There are still about 30 days until the Aug. 7, 2018, primary election and about 120 days until the Nov. 6, 2018, general election. The following is a list of the 10 candidates or groups that have spent the most on broadcast advertising so far this year and where their money is coming from. 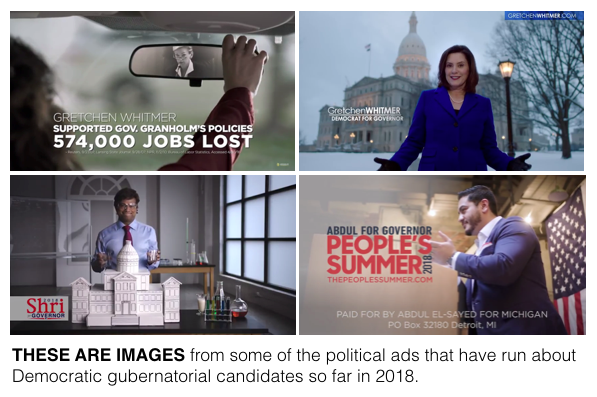 Thanedar continues to lead in overall TV advertising and was the first gubernatorial candidate to air ads this year. Thanedar’s campaign had raised $5.99 million as of the end of 2017. About 99 percent of the money had come from Thanedar himself. State-level candidates, including Thanedar, will have to file their first campaign finance disclosures covering 2018 on July 27. Similar to Thanedar, Pensler, a GOP businessman running for the U.S. Senate, has primarily been funding his own campaign, and he’s been busy purchasing TV ad time. His campaign has already aired about $893,00 in broadcast ads. He’s also spent heavily on cable advertising. Pensler gave his campaign $5.0 million out of the $5.1 million it had raised as of the end of March. Build A Better Michigan has quickly moved its way up the ad-spending rankings. The 527 organization launched its TV ads in early June and has been the top spender on broadcast political ads in Michigan since mid-June. The organization’s contact person is Mark Burton. He once served as former Senate Minority Leader Gretchen Whitmer’s chief of staff when she was in the Legislature. The group will likely file its first fundraising disclosure with the Internal Revenue Service on July 15. The campaign of Lt. Gov. Brian Calley has been the top broadcast TV advertiser among Republicans running for governor so far this year. The campaign’s largest donors include the Calley-connected MI PAC, which gave $25,000, Cynthia Pasky of Strategic Staffing Solutions, who gave $6,800, and Chris Wilcox of Centria who gave $6,800. 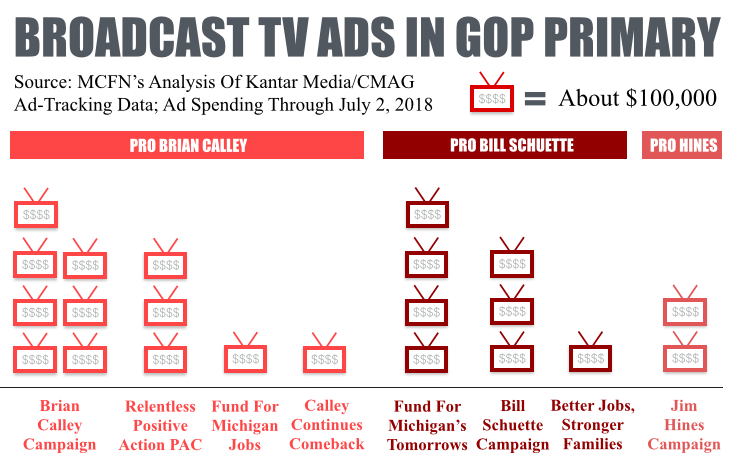 The nonprofit Fund for Michigan Jobs ($148,000) and the Super PAC Calley Continues the Comeback ($63,000) have also been running broadcast ads that aim to boost Calley’s chances. Michigan Families for Economic Prosperity has run ads featuring individuals writing letters to U.S. Reps. Mike Bishop, a Republican from Rochester, and Fred Upton, a Republican from St. Joseph. Some of the ads criticize Bishop and Upton for their stances on health care and tax policy. The ads don’t fall under disclosure requirements, so the group, which describes itself as a “coalition of advocacy leaders,” doesn’t have to disclose where its funding is coming from. The Fund for Michigan’s Tomorrows, a social welfare organization, has been running ads touting Attorney General Bill Schuette’s policy stances. The ads don’t expressly say people should support him so its ads avoid reporting requirements. The organization formed in 2014 and was originally based out of a law office in Midland. Democrat Abdul El-Sayed, Detroit’s former health director, has been increasing his spending on TV advertising as the primary election nears. But he’s still behind Thanedar and the 527 supporting Whitmer. El-Sayed’s campaign had received more than 8,000 individual contributions as of the end of 2017. Sixty individuals had given the maximum of $6,800. The national nonprofit Americans for Prosperity, which doesn’t disclose its donors, has been focused on criticizing Whitmer this summer. The group had aired an estimated $389,000 in broadcast TV ads as of July 2. The ads began in June. But according to filings with the state, the group has reported about $2.1 million in independent expenditures against Whitmer, including TV ads and mailers. The group has previously been supported by Charles and David Koch of Koch Industries. The RPA PAC, which is tied to Gov. Rick Snyder, was a heavy advertiser in March and April but has been quiet in recent weeks. The PAC’s top donors since the start of 2017 have been Roger Penske, Penske Corporation executive, who gave $250,000, and William Parfet, Northwood Group executive, who gave $100,000. The nonprofit Fund for Michigan’s Tomorrows has aired about $408,000 in broadcast ads boosting Schuette. And a Super PAC called Better Jobs, Stronger Families has aired another $136,000 in broadcast ads backing Schuette. But Schuette’s campaign hasn’t sat by silently. The campaign itself has aired about $273,000 in broadcast ads so far. As of the end of 2017, the campaign had reported more than 4,000 contributors, including 97 individuals who gave the maximum $6,800.